Admission gates open 5:30 p.m. to 8 p.m. This year, the Zoo is partnering with The Greater Baton Rouge Food Bank to bring more impact & excitement to Zoolights. Every guest presenting non-perishable food items (minimum of one per person) during the hours of Zoolights, will receive a 50% discount from the regular admission price. Regular admission prices for Zoolights will be cut in half when a non-perishable food item is presented at the time of entry & all food donations will go directly to the Greater Baton Rouge Food Bank. 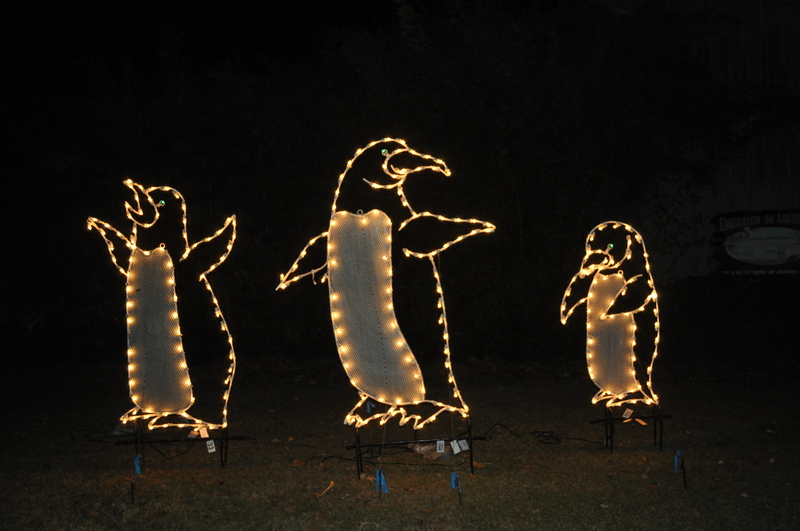 A: ZooLights begins the day after Thanksgiving and ends on December 30. The Zoo is closed for Christmas Eve & Christmas Day. Q: What are the hours for ZooLights? A: Admissions are open 5:30 p.m. to 8 p.m. Zoo grounds close at 9 p.m.
Q: Will I be able to see Zoo animals? A: Animal viewing is limited at this event, as many of our animals are brought inside for the night. ZooLights is an evening, holiday event that does not offer the same viewing opportunities as a daytime visit. Q: Can I walk around the entire Zoo during ZooLights? A: No. Certain areas of the Zoo are closed for this event. For your safety, we ask that you remain on lighted, designated paths at all times. Q: Is food available for purchase? A: Yes. The Flamingo Cafe will be open and serving specialty holiday items in addition to the regular menu. A: ZooLights remains open during rain. Dress appropriately for the weather. The Zoo does not issue refunds or rainchecks. Q: Will the Safari Post Gift Shop be open? A: Yes. The Safari Post Gift Shop will be open every night for ZooLights. The Zoo is the perfect place to do your holiday shopping! Q: Can I bring my flashlight? A: No. Flashlights and laser pointers are not allowed for the safety of our animals and for the courtesy of other guests. You may take photos or video without a flash.